December 31, 2009  The lackluster economy has hung over everything the Obama administration tried to do this year. Rising unemployment dogged the president throughout his first year in office. Obama spent several days huddled with economic advisors before leaving on his Hawaiian vacation. The White House faces many challenges as it tries to put more people back to work in 2010. December 30, 2009  Republicans were quick to pounce on perceived missteps by the administration after the failed attempt to blow up an airliner Friday. But the holiday timing of the incident is a double-edged sword: The GOP criticism of the president has received intensive coverage, but many people aren't fully plugged in. December 28, 2009  President Obama said Monday the government was doing everything in its power to keep the traveling public safe. Obama was making his first live public statement since a failed attempt to blow up a U.S. jetliner on Christmas Day. 1 Year Later: Has America Been Remade? December 28, 2009  It's been almost one year since President Obama took office. On his 100th day in office, the president said the work of remaking America had begun. How has 2009 treated the administration? What are the turning points, highlights and troubles for the Obama administration? December 14, 2009  President Obama met Monday with the nation's biggest bankers, hoping to jawbone them into providing more small-business loans. Previous administration efforts to boost credit have not yet paid off, and cash-starved business owners are growing impatient. December 8, 2009  President Obama said the country must spend its way out of the recession and create new incentives for hiring. The remarks came in an economic policy speech at the Brookings Institution. December 7, 2009  Sandwiched between his speech on the Afghanistan troop build-up last week and two international speeches later this week, President Obama will deliver an economic policy address Tuesday. Patience with the pace of government action is running short on Capitol Hill, and many Democrats fear the public is starting to question whether Obama feels their pain. December 4, 2009  President Obama is changing the time of his appearance at the Climate Change Conference in Copenhagen. 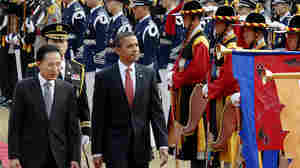 The White House said Obama will visit Denmark on Dec. 18, at the summit's more crucial phase, instead of next week. December 3, 2009  With more than 15 million Americans looking for work, President Obama held a jobs summit Thursday at the White House. He brought together business leaders to talk about what can be done to boost employment. Does Creating Jobs Mean Creating More Debt? December 3, 2009  The White House is hosting a jobs summit Thursday to collect ideas about how to put people back to work. Since pushing for the stimulus package earlier this year, the president has been hesitant about spending a lot more money to create jobs. He's caught in a tug of war between those worried about rising unemployment and a rising federal deficit. December 1, 2009  The Obama administration is pushing the mortgage industry to do more for homeowners at risk of foreclosure. A $75 billion government program has yet to provide permanent help for many borrowers. Some consumer advocates say it's time the government took a harder line with lenders. The Treasury Department says it could levy fines on companies that aren't doing enough.